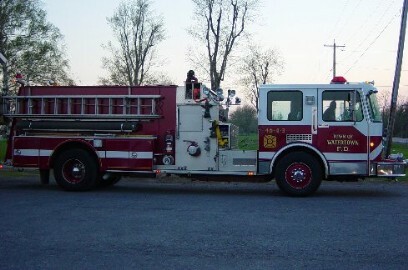 Engine 3 is a 1991 Grumman Engine with a 1500 gpm pump with a Waterous Mid-Ship Pump which serves as a first arrival engine at any scene on the west side of town. This truck carries 1,000 feet of 5 inch hose and 650 feet of 1 3/4 inch hose. In addition to fire hose, equipment carried on Engine 3 includes 5 Self Contained Breathing Apparatus (SCBA), a 32 ft ladder, 14 ft roof ladder, attic ladder, portable fire extinguishers, foam equipment, portable lights and cable, and other assorted tools and equipment.